Friends who have rolled a mile in your shoes are precious indeed. They understand issues that others may not and can offer lifestyle suggestions or comforting advice at times when you need someone who can relate. Often though, the challenge for many people who are new to using a wheelchair is finding a larger circle of friends who get it. That’s why we’re sharing the following fellowship opportunities and connection points, courtesy of Cure Medical. For all the negativity that circulates on social media, an incredible silver lining exists in the form of private groups on Facebook. Most are strictly managed by admins and have participation rules that members need to meet in order to join. Membership criteria are usually related to a specific medical condition like spinal cord injury, spina bifida, transverse myelitis, multiple sclerosis, etc. To find a condition-specific Facebook group, go to the Explore tab on Facebook, Select Groups/Discover and then search using terms related to your lifestyle interests. 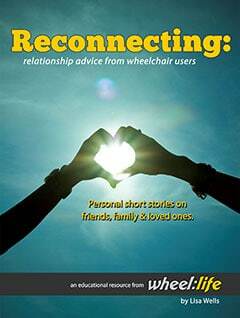 You can also ask friends who use wheelchairs which Facebook groups they know of or feel are the most helpful to them. Warm weather means it’s time for outdoor sports and activities! If you want to set your wheels in motion for an adaptive adventure, we have some fantastic ways for you to try a new sport or activity in a peer-oriented setting. Community groups like the Triumph Foundation host ongoing events throughout the year that are designed to help members discover a new sport or adapted activity while boosting their social network too. Their events appeal to a wide range of interests, backgrounds, and abilities. The next highly anticipated Triumph Foundation outing is their annual Wheelchair Sports Festival held in Santa Clarita, California on April 27–28, 2019. It’s free to attend; they simply ask that you let them know you’re coming, so they can have a grilled hamburger waiting for you during their cookout! Another one of our favorite Triumph experiences led by Anthony Orefice is sure to attract anyone with a need for speed! See the action footage below. Fun and fellowship on wheels isn’t only available for big kids who roll. Parents can struggle, though, to find a safe environment for their child to connect with other kids who share their disability. Thankfully, traditional summer experiences for kids are becoming more inclusive due to a variety of groups across the country. So pack your bags, it’s time to enroll in an accessible summer camp for kids! Easterseals offers 30+ day camps and residential camps for children and adults with special needs. These programs serve to help campers discover and explore new interests while also creating lifelong memories. They provide activities that may not be as easily accessible to children and adults with disabilities in other settings. 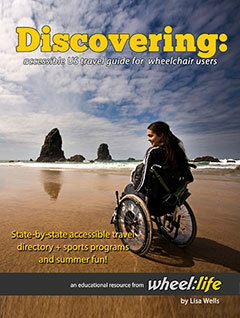 Browse the Easterseals Camp & Recreation Directory on their site. The CURE NATION website also offers a free resource you’ll love that includes a list of excellent summer camps for kids who have spina bifida, including all the necessary details for your happy campers! View spina bifida summer camp options here. Ladies, if you are seeking closer friends who roll, we cordially invite you to join the 2019 Rollettes Experience this August in Los Angeles! The Rollettes Experience develops a growing sisterhood of women empowering women who have disabilities. More than 100 ladies and 25 kids from 9 countries attended last year’s Rollettes Experience, and this year’s event will be even bigger as it continues to grow thanks to the leadership of this wheelchair dance team made up of six extraordinary women — Chelsie Hill, Steph Aiello, Samantha Lopez, Edna Serrano, Maria Rabaino, and Conner Lundius — who are all friends with different injuries and abilities. See what’s in store here for boundless women who roll. The traveling roadshow known as the Abilities Expo aims to bring necessary products and services together under one roof for the community of people with disabilities, their families, caregivers, seniors, and healthcare professionals. It’s about introducing opportunities that can enrich your life…especially ones that you never knew were out there. With thousands of people attending each FREE Abilities Expo, you’re sure to meet a new friend or two along the aisles as you find enlightening resources and lifestyle aids too. Sign up for your complimentary pass to attend an Abilities Expo near you at Abilities.com. Beyond these events, if you are looking for ongoing connections in a supportive environment, don’t overlook the power of local peer group meetings. For people with disabilities, peer support groups can be a great way to network with your local disability community, get resources, and even learn helpful life skills. We all know that there can be a lot to navigate, but you don’t have to do it alone. Our friends at Cure Medical offer a free directory of local community support groups on their website – click here to view. Organized by state, this list contains peer support groups for people who have cerebral palsy, traumatic brain injury, multiple sclerosis, spina bifida, spinal cord injury, and other conditions that may impact people who use Cure Medical intermittent catheters or closed systems. So what are you waiting for? Get out and enjoy life with a larger group of friends using the above opportunities.